I love a good schnitzel, but as far as I’ve been able to tell, I have to travel along way from my home in Northern New Mexico to find one of those (even though green chile would be a natural with schnitzel!). In fact, really good ones have not been all that easy to find anywhere in the US where I have traveled. I lived in northern Bavaria for several years and developed a taste and a fondness for German cuisine including the venerable Wienerschnitzel mit pomme frites … standard gasthaus fare in the area I lived. I certainly keep a look out for interesting looking German restaurants wherever I travel with hopes of coming across a good schnitzel. What has schnitzel on my brain today? I just came across a post by Phoenix & Phoenix titled The World’s Biggest Wiener Schnitzel complete with mouth watering photos (@phoenixnphoenix). I hope you will enjoy their article as much as I do. So where have I found a good schnitzel in the USA? If you have a chance, try the Rathskeller at the Athenaeum Turners Club in downtown Indianapolis. I used to live across New Jersey Street from this interesting and historic venue, and in fact, my wife and I held our wedding reception there 30 years ago yesterday! It has been many years since we lived in downtown Indy, but at the time it was a neighborhood “in transition” to put it kindly. We have fond memories of St. Benno’s Fest and other German infused events … usually with a goat in attendance … but that’s a whole ‘nother story. I don’t know whether those kind of things have survived the years as that part of downtown Indianapolis has become quite popular and has been renovated considerably. I have stopped in there for a schnitzel whenever I’ve had a reason to be in Indy over the years and it has been consistently good. 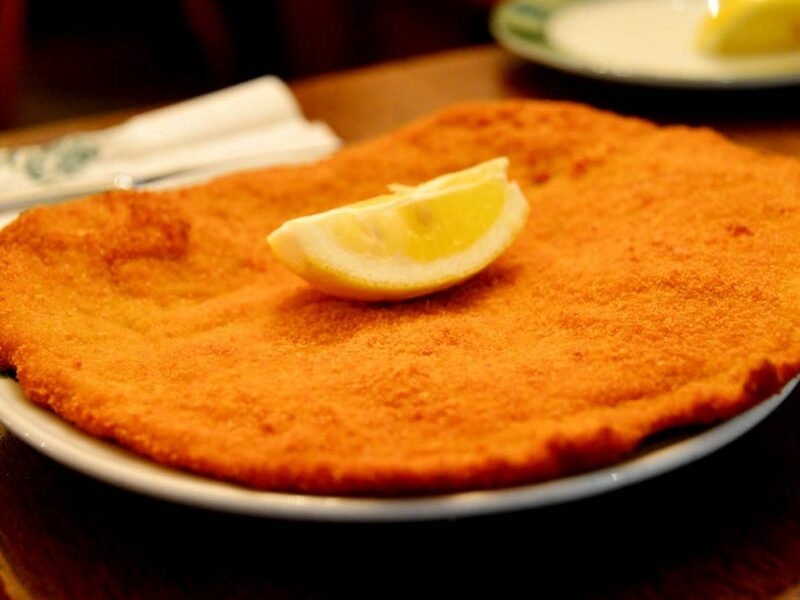 Do you have a recommendation about where to experience a good schnitzel? Please post a reply and tell us about it. Growing up in Indiana, I also have fond memories of huge tenderloin sandwiches which are reminiscent of Schweineschnitzel. Something tells me that those things trace their ancestry to the old world schnitzel, but I don’t know that for sure. Maybe someone who reads this will know and fill us in. If you want help finding a good tenderloin, check out the blog of Tenderloin Connoisseur Rick Garrett, the Pursuing Pork Tenderloin Sandwiches Facebook Group, or check out the upcoming Tenderloin Throwdown Annual Happening on June 25 in Greensburg, Indiana. Hungry for a schnitzel or a tenderloin in the meantime? Check out these easy recipes and DIY. The schnitzel recipe is from Allrecipes.com and the tenderloin sandwich recipe is from Foodnetwork.com — Tell us how it worked out … or better yet share your own recipe. Find great recipes and product reviews from our friends at the Village Bakery. Previous PostMoving Forward, Looking Back on the Old Spanish TrailNext PostI am Spartacus!